At Our Lady of Lourdes children are taught to live out the Gospel values of love and charity. We have a number of charities which we support throughout the year. Catholic Care provide huge support to the pupils and families in our school and throughout the Diocese. Every Lent our children hold a range of fundraising events to raise money for the Good Shepherd Appeal. In May 2018, along with St. Patrick's, Huddersfield, our children were chosen to lead the Good Shepherd Service in St. Anne's Cathedral. The service was agreat success. Our children performed dances, acted and delivered readings as all of the other schools in the Diocese presented cheques to Bishop Marcus. This was a wonderful opportunity for our school and a proud day. Here are some pictures from the service. We work with St. Patrick's Mission in Bradford. The Mission is run by the Franciscan Friars of the Renewal (CFR). The Friars work with the poor of Bradford City centre. They run soup kitchens throughout the week and have Food and Clothes Banks to provide for those in need. During Lent families at our school donate food and clothes for the Mission. We have also been lucky enough to welcome some of the Friars to our school. They gave an assembly and worked with some of our classes to explain what they do and why. 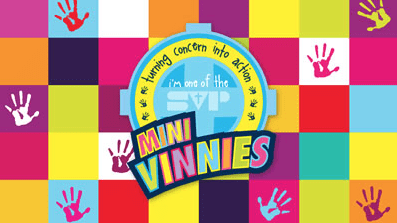 In 2018 the school began a Mini Vinnies. This is an initiative run by the St. Vincent De Paul Society. A group of children were chosen to be Mini Vinnies and made promises in front of the whole school. Moving forward, this group will meet regularly with Mr Finn and decide upon ways to help in our Parish. Since forming, the Mini Vinnies have made several trips to the Friday Friends club at the Church. The elderly from our Parish have loved meeting the children, talking with them and playing games. Every Christmas parents and children donate items suitable for new born babies. These are distributed to new mothers in the diocese. Since it opened, our school has formed close links with the hospice. Pupils have visited to see how they support poorly children and their families. Our choir have recently sung at fundraising events and we have held dress up days to raise money. Sadly many people have been affected by, or know someone affected by, cancer. Each September we host a bun sale, coffee morning and non uniform day to show our support for the MacMillan Nurses. As well as MacMillan Nurses we have also promoted World Cancer Day on 4th February 2016. As well as giving to charity pupils are encouraged to look after the world around them. Our children do this by recycling in school, growing their own vegetables and looking after our chickens in the allotment.